1. LLbean snow molds. Pack and fly the perfect snowballs, easily go from cabin-fever to igloo-fever! 2. Aladdin soup bowl thermos. Not the thermos your mom sent you to school with, that leaked lukewarm liquid and made your whole lunch smell like minestrone soup.... this one stays closed, and stays steamy. 3. L'Occitane ultra rich rosebud cream. Dab some onto their cheeks after playing in the snow, rub some onto your legs after a nice long tub saok. 4. Rubber Duck retro snow joggers. How can you resist those retro rainbow stripes?? 5. Fred "ABC" cookie cutters. Already been chewed! The kids'll go nuts for this one. 6. Netflix. This sheer genius is self explanatory. 7. 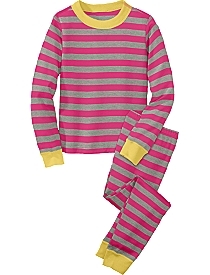 Hanna Anderson organic cotton PJ's. Timeless. Cozy. Classic. 8. Crocodile Creek,World of Animals Puzzle. Can't go wrong with animals and geography. Pieces are large enough for little hands and just tricky enough to kill some time. 9. Eurosled Snow Spider. Delivers the ultimate downhill ride.